Hiking is a long and adventurous walk through a valley or up a mountain, which is done on foot with or without the use of specialist equipment. 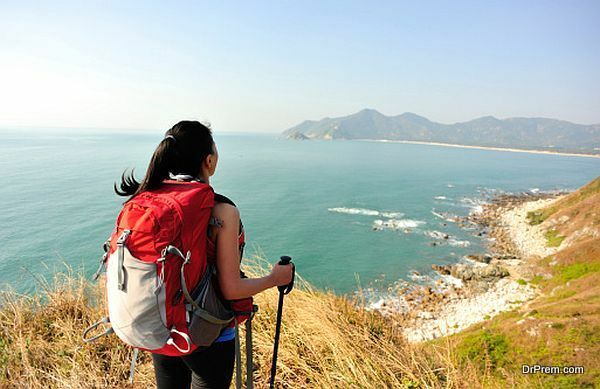 There are some factors that should be taken care of when a person is going hiking in order the make the trip a pleasant one. The crucial factor during hiking is weather; it can make your trip by providing the perfect day or break it by showing its cruel nature. One should always check the weather conditions when planning a hiking trip so that unexpected bad weather doesn’t ruin your mood and turn your trip into unpleasant one. Once you decide on a trip, try to make an emergency plan for if the weather goes bad. Avoid going on lone hiking trips unprepared. Alone you have no one to assist you if you run into trouble, and if something unexpected happens, it’s easier for rescue parties to find a group rather than a lone hiker. Maintain a list pertaining to your trip and include what things you will need to make the hiking trip safe, secure and pleasant. Pack your equipment and check that they are in proper order to avoid any problems arising during the trip. You can keep some cosmetics like sunscreen lotions, mosquito repellent etc, because you will be outside for a long time which means a lot of exposure to the sun. Try to take break during the trip in order to preserve your stamina, as over exertion may result in sickness or injury. Breaks will help you to overcome the pressure of the trip and make the trip a pleasant and memorable one for you and your group.